This summer we’ll be welcoming thousands of students to the greatest classroom on earth as we, in collaboration with our friends at Parley for the Oceans, launch our brand new ‘beach-side’ plastic pollution education (and action!) programme with 15 South West schools at some of our most iconic beaches. KIDS CLUES – Want to get started as an Ocean Guardian straight away? Scroll down to ‘What Happens in Ocean School’ and dive straight in! We couldn’t be prouder of our education programme, which in recent years has enabled us to visit hundreds of schools across the UK and work with and learn from some truly incredible young ocean activists. From tiny schools of five students on the Isles of Scilly to the biggest primary school in the UK in Birmingham we are always made to feel so welcome and never fail to leave without loads of new ideas (and friends!). Now it’s our turn to invite these guys to our classroom, a place that fills us with wonder every time we visit and like every great teacher inspires and empowers us to look beyond the horizon, the ocean. When it comes to learning about environmental stewardship our ocean and coastal environment is the perfect classroom. From interactive biology in the mini-ecosystems that are presented in wonderful 3D in rock pools to the simple, yet vital citizenship lessons in hard work and collective action that team beach cleans present our beaches and oceans provide glorious, sometimes challenging real life examples of every imaginable subject in the curriculum and more! Why do we need Ocean School? Plastic pollution has sadly become synonymous with any coastal activity, from surfing to swimming, beach holidays to wildlife watching – it is simply an expected part of our experience. This is why marine plastic pollution, and specifically tackling society’s slavish reliance on throwaway plastics, is now our top priority. It is an issue that connects the environment with all areas of society, and is something that we can take positive action on at every level. Indeed, it will only be through concerted collective action that we will be able to create the paradigm shift that is needed to stop the flood of plastic pollution washing over our world. Education will play a pivotal role in creating plastic free coastlines and as such it is our responsibility to create innovative, inspiring education programmes that encourage and support behaviour change. In response to this necessity we are proud to present Ocean School…………. Ocean School is an immersive hands-on education programme designed by SAS in collaboration with Parley for the Oceans to raise student’s awareness of the plastic pollution problem in the places they love… and ask for their help! Ocean School will provide students with the opportunity to explore, investigate and respond to the environment they live in. Empowering them to identify and embrace the vital part they play in protecting the places they love. Our ‘Ocean School Graduates’ can become guardians of the oceans for us all. The beauty of Ocean School is that all you really need is a beach and a little bit of imagination. 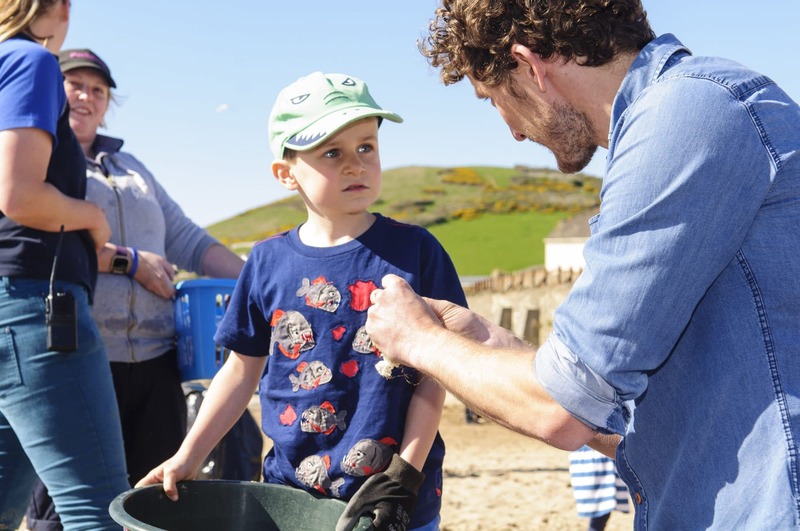 We’ve brought together all of the most popular elements of our education and beach clean programmes and combined them with ideas inspired by some of incredibly vibrant environmental education schemes run by our friends across the world. Just for good measure we have also thrown into the melting pot all of the many, many wonderful conversations that we’ve had with you guys; our members, Regional Reps, Lead Volunteers, beach clean volunteers, supporters and mini activists over the last 10 years. All of this means that Ocean School is bursting at the seams with engaging, enraging and empowering information and activities for the young ‘Ocean Guardians’ who take part. What Happens at Ocean School? The most difficult task we had in creating Ocean School was what to leave out!? We could (and would love to!) spend weeks on the beach with just one class of students and only begin to scratch the surface of both the wonders of the ocean environment and, sadly, the terrible threat that plastic pollution poses to this precious, vital resource. However our aim is always to give as many youngsters as possible the chance to take part in Ocean School so we’ve put together a jam packed two and half hour session that takes into consideration all of the different ways in which our youngsters learn and gives the students the information, inspiration and practical tools they need to become Ocean Guardians. Plastic Free Coastlines 101 – Down to business. Our first and most important task is to engage, enrage and inform the students on the impacts that ocean plastic pollution has. From the harm it causes to wildlife to the toxic threats of microplastics, this interactive lecture will arm the students with shocking stats and facts, equipping them for the campaign ahead and lighting the activist fire in their bellies! Ocean School Broadcasts – Making Ocean School available to all! As well as joining us on the beach schools, students and, well anybody really, will be able to tune into our four online programmes and explore all of the subjects in even more detail. ‘SAS X Parley Ocean Schools’ Plastic Free Coastlines Awards 2017 – Celebrating solutions. All participating schools will be encouraged and supported to continue to develop their A.I.R solutions into real project proposals and submit them digitally to SAS HQ. 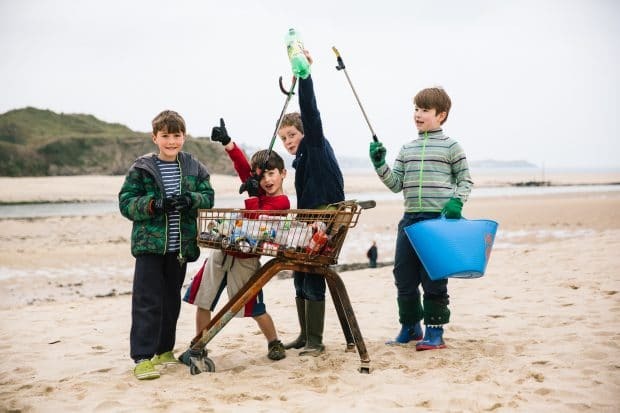 They will then be entered into our annual Plastic free Coastlines Innovation Awards to be in with a chance of winning a project grant (and super cool trophy!). Not only is Ocean School fun and engaging for the students, we’ve also worked really hard to make sure that the programme fits with your curricular aims. Focused on Key Stages 1 -2 but highly adaptable, Ocean School hits numerous attainment targets in Geography, Citizenship, PSHE, Science and more. We have also created a suite of background resources such as; lesson plans, plenary activities, learning outcomes and supporting physical resources that, together, will mean that Ocean School enhances the awesome work that our schools are already doing. One of the things that we love most about our oceans and beaches is that they are free for all to use and enjoy, there are no ‘cheap seats’ or VIP areas on the beach or in the line-up, everyone has an equal right to be there. This also means that we are all responsible for the protection of this awe inspiring environment and it is these two principles that Ocean School was founded upon. So whether you’re a teacher, student, big wave surfer or champion sandcastle maker you are welcome to enrol at Ocean School anytime. Simply get in touch with our Education Team leader Ellie at [email protected] or give us a call on 01872 553001 and we can help you create your very own Ocean School classroom! Take pride, you are the next generation of ocean guardians. You can be the catalyst for the continued protection of the environments we love! « The Barefoot Wine Beach Rescue Project is back for another year!